Great numbers of grapes were peeled, little quail birds broken down, and many bottles of Gewurtztraminer opened. 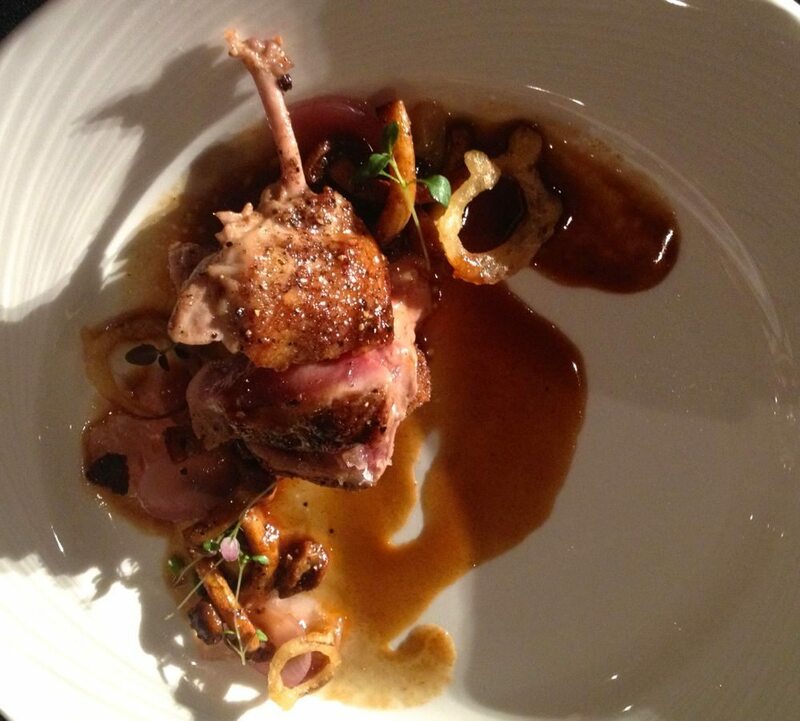 Patrick Garland of Absinthe Café took home the top prize last night, at Gold Medal Plates 2014, for his Quail with Raisins. Beneath the crisped, bronzed skin of the breast, he stuffed a layer of foie gras. 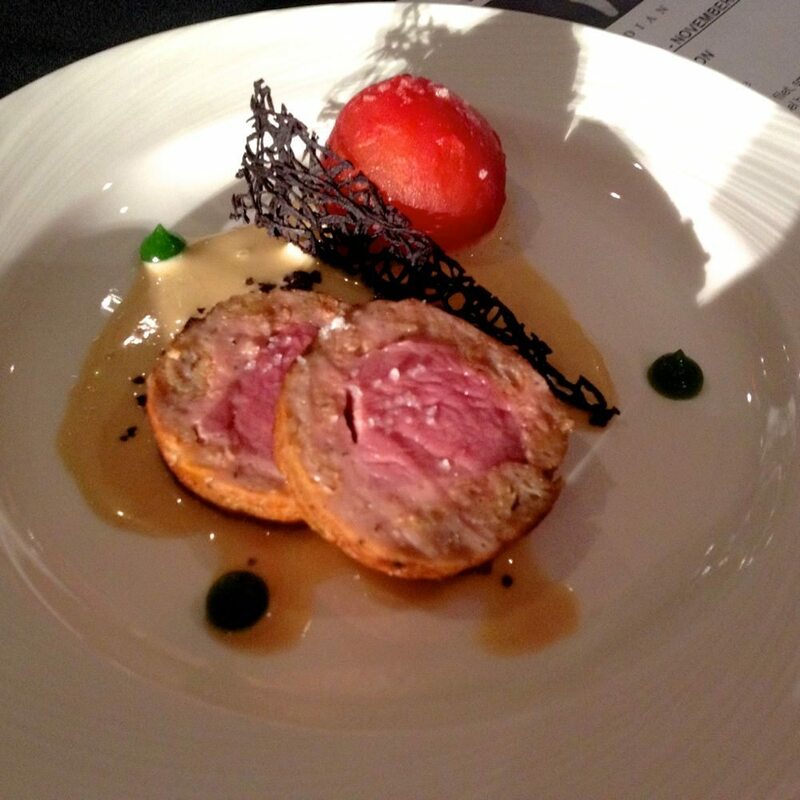 He fashioned a flavour-packed ‘croquette’ with the thigh meat, added some crunch to the plate with delicately-frittered rings of shallot, some acid with pickled cinnamon cap mushrooms and worked pretty seamlessly, a half dozen bottles of the Tawse 2013 Gewurtztraminer into the rich, elegant sauce. My photo of it is pretty appalling, but here you go. Garland will now move on to the next level, representing Ottawa at the Canadian Culinary Championships in Kelowna in February. 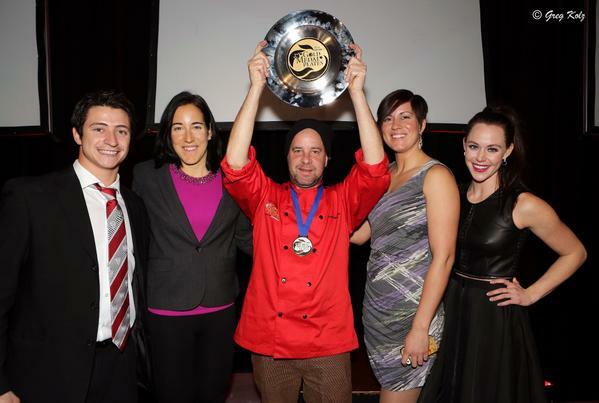 One chef still to be determined in the national roundup: the Gold Medal Plates culinary train chugs into Regina this Friday for the final instalment – but if you’d like to read up on what will be Garland’s competition thus far, GMP culinary advisor James Chatto has full write-ups on each city’s winning chefs and their dishes. Steve Wall of Supply and Demand placed second with an elegant, pretty straightforward dish that allowed some gorgeous aged beef to shine. On the plate were scattered some fascinating elderberry capers, pickled onion, delicate greens, and for the fat, he had smoked a bunch of oysters and pureed them in a mayonnaise. Wall paired the dish with Redstone Winery’s 2013 Sauvignon Blanc. Though none of the judges was wild about the chewy mussels tucked beneath the smoked tomato, we were all wild about the smoked tomato itself and the way chef John Morris of the National Arts Centre had played it with the sweetbread robed, besan-crusted veal filet, the brilliant dots of tarragon gelée, the tuile of black olive. Pooling beneath the meat were two sauces, a reduced mussel broth and a butter sauce enriched with veal marrow. Morris chose the 2013 Dragonfly Pinot Grigio from Pondview Estates to work with the dish. 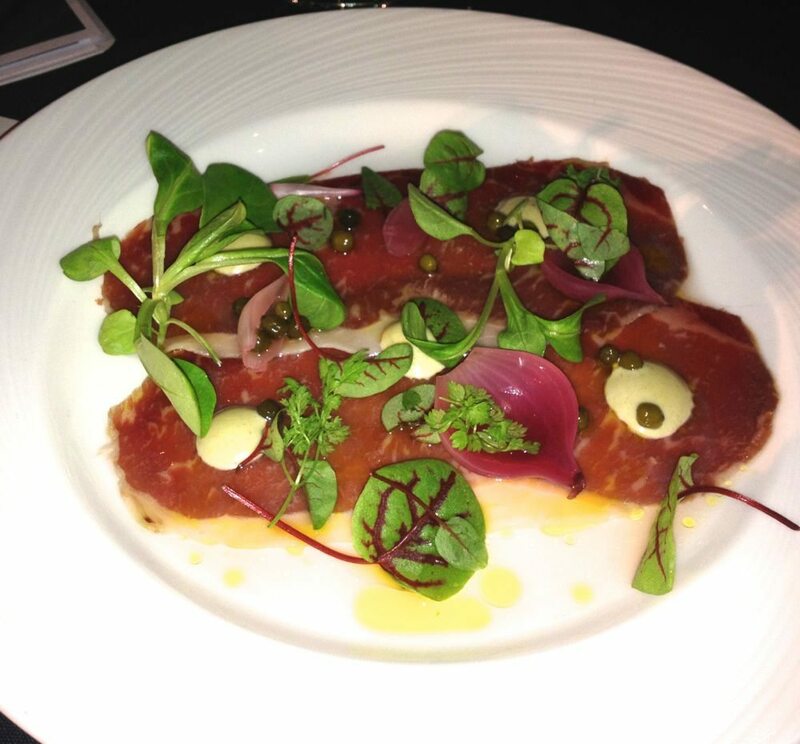 It was an evening of merry making, and delicious food from ten gifted Ottawa-Gatineau chefs. 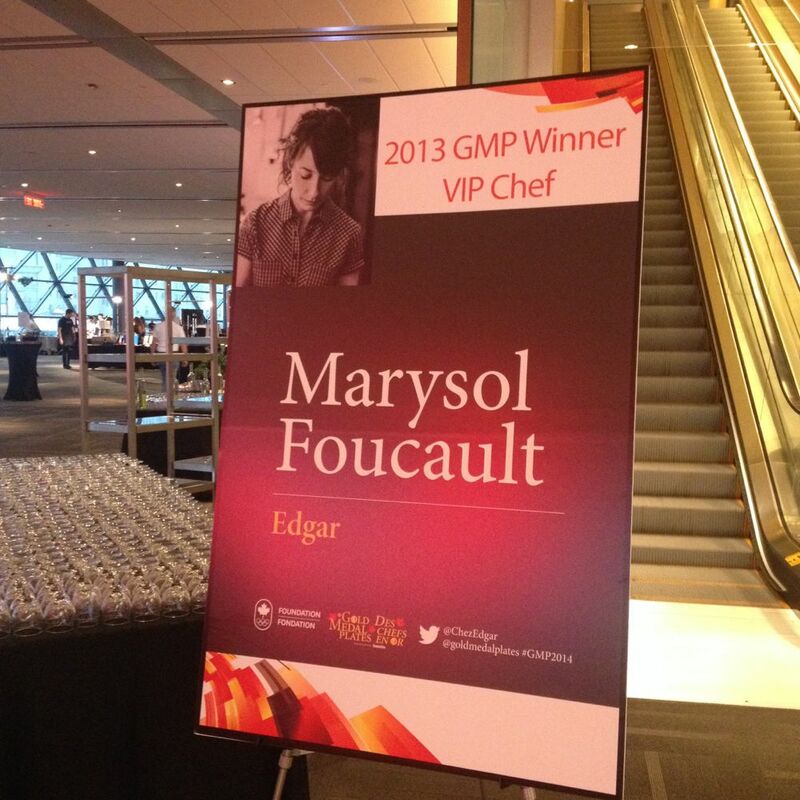 I’d like to thank my fellow judges – James Chatto, chef Judson Simpson, Margaret Dickensen, Sheila Whyte, Pam Collacott, and last year’s GMP winner, chef Marysol Foucault. And cheers to Chatto, who gets to go across the country, eating like a mad man, in order to pluck out the best of the best, chefs from St John’s to Victoria, and gather them all in Kelowna for the national cook off in support of Canadian Olympic athletes. Congratulations to all competing chefs, and their teams, and to Patrick Garland, we wish you great success at the Canadian Culinary Championships in Kelowna this February.